I haven't shared my extensive list of New Year to-do's for 2012, but one of my favorite items so far has been to complete a series of exploratory writing exercises from which we have developed our Family Rules, Family Needs (I'll share more on this in another post), and Family Mission Statement. Whether you seek daily clarity or long-range guidance, a mission statement is such a great place to start. To begin, I pulled content from our Family Values and Family Needs documents, and also took inspiration from Simple Mom who has a really helpful post on the how-to's of developing a family mission statement. To reflect on who we are collectively and as individuals, what our dreams are made of, where our priorities lie, and to define what we believe is our family's purpose--to each other and in the greater context of what we believe is the purpose of life--what we value, and how we aspire to live, brings tremendous insight to my responsibility of guiding our family into the future. Our mission statement unites the four of us and declares our intention to be true to ourselves as we move through life together. 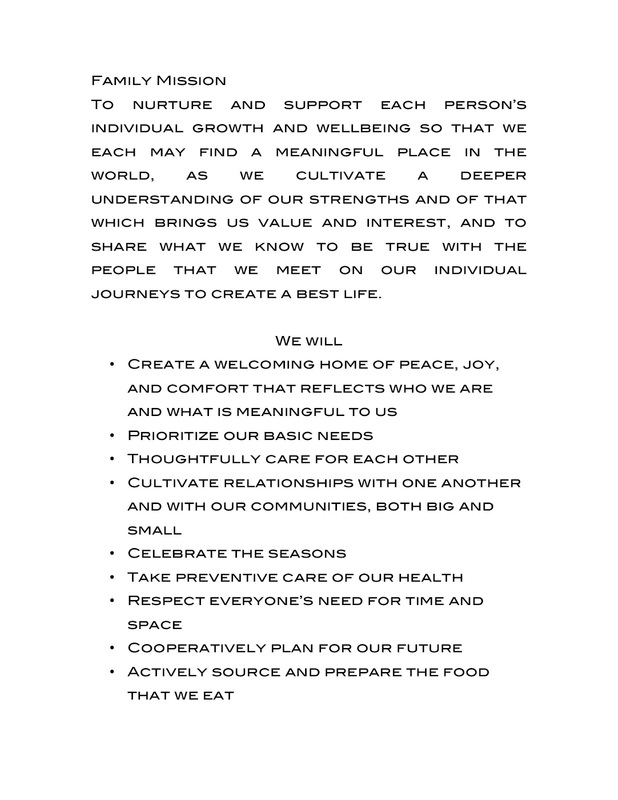 I love that our mission statement applies as much now to our young family of four, as it might ten years down the road to our future family of six (or more!). Timeless. Yet we are at liberty to refine it as we grow and change. Have you developed a mission statement for your family? 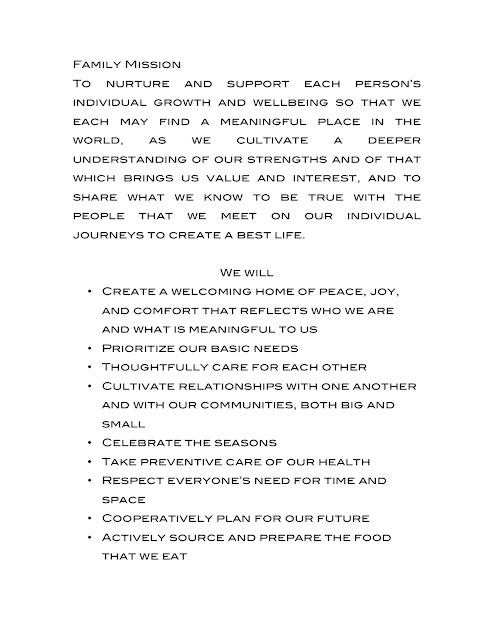 UPDATE: A refined and revised version of our Family Mission Statement can be found here. wow ! My first reaction is that i just love your mission statement. But then it's also really thought-provoking. I'm so mired in the demands of every day/minute that this long-ranging, big picture view (with a focus on purpose) is really appreciated. Looking forward to hearing about Basic Needs, as well. Useful article , For what it's worth , if anyone is searching for a What My Family Needs to Know , my company filled out and esigned a fillable form here What Family Needs Know.